India has the world's highest population of stray dogs with an estimated 30 million dogs roaming the country's streets. In addition to canines, drivers also have to worry about hitting free-roaming cattle on their commutes. Now, as Mashable reports, an organization in one south Indian city is combating the issue by outfitting animals with reflective collars. The initiative was launched in response to a poll that revealed most motorists in the city of Chennai had trouble noticing animals at night. 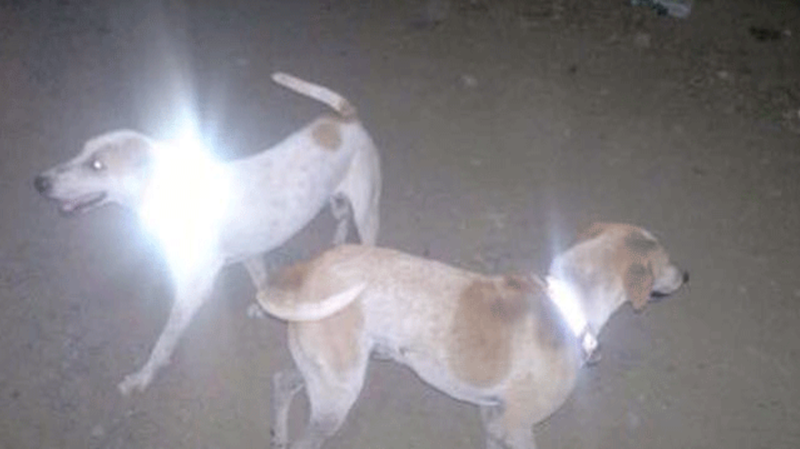 The organization that conducted the survey, People for Cattle in India, has since equipped 300 dogs and cattle in the city with collars made from reflective material. The gear has also proved successful in protecting dogs in cities like Pune, Jamshedpur, and Bengaluru. India is one of the world's worst nations for road safety, a fact that isn't helped by the out-of-control stray animal population. People for Cattle still has a long way to go before the rest of the strays in Chennai are equipped with their so-called "magic collars," but for now they're calling upon local animal lovers to reach out to them for collars to distribute in their neighborhoods.